Classical Latin was used in the 1st century BC, and was the official language of the Roman Empire. It was widely used in the Western part of the Mediterranean. 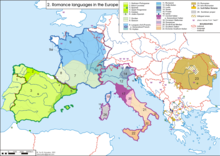 The languages known as Romance languages developed from the spoken version, called Vulgar Latin. Latin is called a dead language because no one speaks Latin as a first language any more. Even though it is a dead language, it is not an extinct language because it is still used in daily life for some people. In fact, many people still study it in school. It is still useful, because it shows how society worked in past times. It can also help understand how languages work. Knowing Latin makes it easier to learn the Romance languages. Today Latin is still used in taxonomy to give scientific names to species and groups of species of living things. Some terms used in medicine to name parts of the body (such as bones) and diseases are also written in Latin. Latin was very important to Christianity for many centuries. It is still spoken today during some religious activities. It is an official language in the Vatican, where the Pope leads the Roman Catholic Church. People in the Vatican sometimes speak to each other in Latin (if they have different first languages). The mass of the Catholic Church may be done entirely in Latin. This is the Mass of the Roman Rite (Extraordinary Form). Lapis Niger is a stele from the 6th or 5th century BC. It bears one of the oldest known Latin inscriptions. There were two types of Latin, Classical Latin and Vulgar Latin. Classical Latin was used by the educated Romans. It is the one used by the Roman Catholic Church and studied by students around the world. Vulgar Latin was the more common spoken variety used by the common Romans. It was the variety taught to the peoples conquered by the Romans. Latin was the most important language in most of Europe in the Middle Ages. It was taught in many European schools, and all universities used Latin as the teaching language. Latin began to lose its importance in the Reformation, but it was still often used by authors of scientific books and encyclopedias. Until about 1900 many universities accepted dissertations written in Latin. 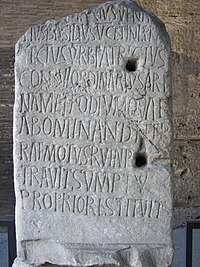 As people from other regions of Europe learned Vulgar Latin during Roman conquests, over time each region developed its own language, a simplified form of Latin. Those languages are called Romance languages, and they are still spoken today. The five Romance languages with the largest number of speakers are Spanish, French, Portuguese, Italian and Romanian. The Romance languages are very similar to each other, and speakers of one Romance language can understand many words and sentences (in both texts and spoken conversations) from another Romance language. For example, speakers of Portuguese can often understand Spanish. It can be said that the Romance languages are modern dialects of Latin. The Latin on this plaque reads: "In the year of 1883 after noon within the second and third hours, the Emperor Francis Joseph, with a company of people, deigned to honor this library with his presence." Latin has almost the same inflection structure as Ancient Greek. It uses a different alphabet, though. Latin has seven different noun cases: nominative, vocative, accusative, genitive, dative, ablative and locative. The vocative case is almost always the same as the nominative case; however, if the nominative ends in -us, it changes to -e, and if the nominative ends in -ius, it changes to -i. The locative takes the form of the dative. Latin nouns are declined, or changed, according to how they are used in the sentence. A noun can be declined five different ways. These ways are called declensions. The declensions are numbered 1 through 5 (1st Declension, 2nd Declension, ...), and each one has unique endings that identify the noun's declension. When a noun is declined, twelve forms are made, two for each of the noun cases (the locative is omitted). Verbs also have a similar thing done to them; changing a verb is called conjugation. When a verb is conjugated, six forms are made. There are five factors that can change a verb: person, number, tense, voice, and mood. In all, there are 120 possible forms of each Latin verbs. Latin used to be written on plates of wax. These had little space, so words were run together (there was no space between words). Sometimes papyrus was used, but this was expensive. Punctuation was an ancient idea, but came to Latin later. Lowercase letters ('small letters') are relatively modern inventions. 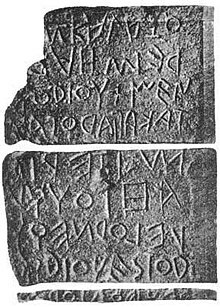 The Roman alphabet was derived from the Etruscan language. The following is the introduction to the Metamorphoses by Ovid; it describes the Golden Age. "This was the Golden Age that, without coercion, without laws, spontaneously nurtured the good and the true. There was no fear or punishment: there were no threatening words to be read, fixed in bronze, no crowd of suppliants fearing the judge’s face: they lived safely without protection. No pine tree felled in the mountains had yet reached the flowing waves to travel to other lands: human beings only knew their own shores. There were no steep ditches surrounding towns, no straight war-trumpets, no coiled horns, no swords and helmets. Without the use of armies, people passed their lives in gentle peace and security." After the fall of the Roman Empire, many people still used Latin. Scholars such as Thomas Aquinas, Petrarch, Erasmus, Luther, Copernicus, Descartes and Newton wrote in Latin. As an example, Hugo Grotius published his work "De jure belli ac pacis" (Common English title: On the Law of War and Peace) in 1625. It is one of the bases of international law. ↑ The Mesha Stele or Moabite Stone is a stele set up around 840 BC by King Mesha of Moab (a kingdom in modern Jordan). The stele uses full stops. Ainsworth, Robert (1830). A new abridgment of Ainsworth's Dictionary, English and Latin, by J. Dymock. This page was last changed on 7 April 2019, at 02:37.